After a brief victory lap that included mischaracterizing a Supreme Court ruling that partly favored his badly weakened travel ban, Donald Trump and his administration may again land in hot water over its enforcement, which began in earnest late on Thursday and already has lawyers scrambling to limit it further. That’s because the justices, in an unsigned opinion, issued guidelines on how exactly the federal government would be allowed to carry out the executive order — guidelines which are significantly less restrictive about who may visit U.S. citizens than Trump’s administration would wish them to be. In its watered-down form, Trump’s order institutes a partial ban on travel to the U.S. for nationals of six Muslim-majority countries for 90 days, and suspends the refugee-resettlement program for 120 days. Lower courts in Maryland and Hawaii blocked these provisions in their entirety, but the Supreme Court has since reinstated them — with important limitations. 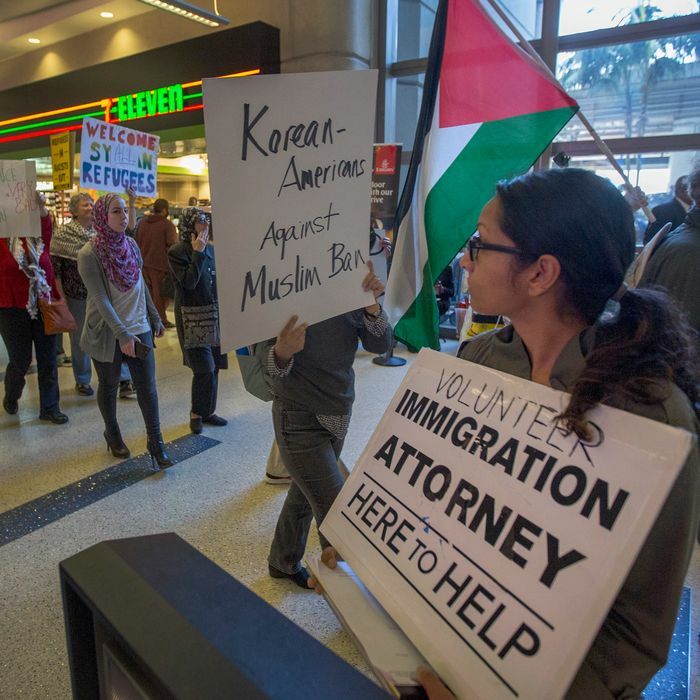 The main one: The Trump administration can’t shut out any traveler from the affected nations who has a “bona fide relationship” to a person or entity in the U.S. That’s a broad requirement that the justices repeated four times, and which should exempt from the ban just about anyone who has a documented, good-faith bond with someone already here. What seems to have tripped up the Trump administration — and made it sweep wider than it should — was a little phrase the justices used only once to illustrate the kind of relationships that might qualify as bona fide: “close familial relationship.” A wife or a mother-in-law, for instance, “clearly has such a relationship,” the Supreme Court said. Does it naturally follow that a grandparent or an aunt — who may have helped raise the person who now wants to reunite with them on U.S. soil — clearly would not have such a relationship? In other words, should these individuals bear the full weight of the travel ban, which Trump signed to protect the nation from terrorists? Of course they shouldn’t. And just moments before the restrictions became effective, the ACLU confirmed that the government had changed its mind about some of its implementation plans relating to which visitors from the countries targeted by the ban would count as “close” family members of someone in the U.S. Long story short: Fiancés are now considered close enough that they would not be excluded, even though a Wednesday cable sent to outposts nationwide initially left them out. But there’s no word on the status of grandmothers yet. As of Saturday night, the State Department still didn’t think they or “grandchildren, aunts, uncles, nieces, nephews, cousins, brothers-in-laws and sisters-in-law … and any other ‘extended’ family members” made the cut. The Government does not have discretion to ignore the Court’s injunction as it sees fit. The State of Hawaii is entitled to the enforcement of the injunction that it has successfully defended, in large part, up to the Supreme Court — one that protects the State’s residents and their loved ones from an illegal and unconstitutional Executive Order. In a briefing with reporters on the day the ban kicked in, the government tried to defend keeping grandmothers out by pointing to existing immigration law, which has for a really long time taken a hardline stance about who may or may not receive a visa based on a family relationship to a U.S. citizen or permanent resident. Under the Immigration and Nationality Act, in fact, grandmothers are out; I can’t petition for my Chilean grandmother to come live with me, even though I’m a U.S. citizen. The same for mothers-in-law. But the Supreme Court justices themselves said, when explaining what a “close familial relationship” means, that the U.S. can’t exclude the Syrian mother-in-law of one of the Hawaii plaintiffs, an American imam. So, what gives? As Adam Cox and Ryan Goodman break down at length in the legal blog Just Security, the Trump administration’s definition of “family” is simply way too restrictive — far more restrictive than the Supreme Court ever intended. What’s more, the government’s reading of the Supreme Court’s guidance flies in the face of the very reason judges across the country put the travel ban on hold in the first place: because allowing it to be enforced would cause “irreparable harm,” both to the targeted noncitizens and those waiting for them here. Can the government really say with a straight face that it would be in “the national interest” to bar a grandmother who would like to visit the U.S. to care for a grandchild? Never mind that the justices have historically recognized, in the constitutional realm, the importance of extended family members. “The tradition of uncles, aunts, cousins, and especially grandparents sharing a household along with parents and children has roots equally venerable and equally deserving of constitutional recognition,” the Supreme Court said in a 1977 case that Hawaii was wise to quote in a Thursday filing seeking to rein in the government’s take on what counts as a close family member. But there’s no need to look that far back. In its ruling Monday — which is only a temporary measure before the travel ban cases are heard in October — the Supreme Court already said that “[a]n American individual or entity that has a bona fide relationship with a particular person seeking to enter the country as a refugee can legitimately claim concrete hardship if that person is excluded.” There may not be chaos at airports this time around, but the Trump administration could already be causing the very “concrete hardship” the justices warned against. Don’t be surprised if the administration’s lawyers — trained in parsing Supreme Court orders — find themselves spending the summer months in court, defending something they could’ve easily avoided from the get-go.